I know I haven’t updated in a couple of weeks – truth is I’ve been writing this post since two weeks ago, but haven’t been able to quite say what I want to with it. Today I decided to just do it, as they say. It’s probably not perfect, and maybe it has no place here. But I wanted to tell the story anyway. Let me introduce you to my Nonna Beatrice. 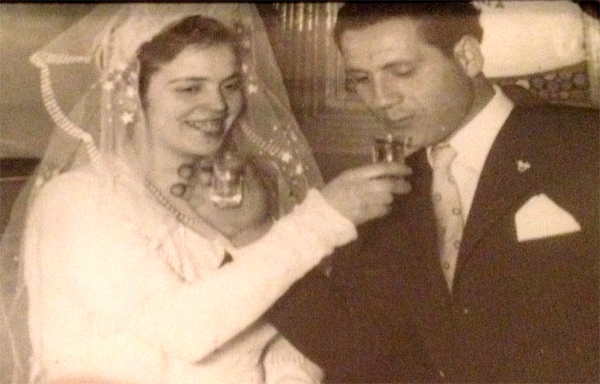 That’s her on the right, with my grandfather, Nonno Giuseppe. On a recent Thursday morning, Nonna woke up, had breakfast and got ready for an outing with her daughter (my mother). She had her clothes laid out and some spending money in the coin purse she always carried with her. The heatwave had finally broken, and the weather that day was pleasant. She’d talked to my mom the night before and was excited about going out. Nonna is a tough lady. Old school: resourceful, practical, all about the family, but not without humor and whimsy. She turned 85 this past February, but you wouldn’t know it by the way she moves and talks. She gets things done. Fast. There is nothing slow about her, including her easy and sometimes sarcastic, but never malicious, wit. Many years ago, I decided I wanted her to teach me how to knit, and she did, but not without my having to ask her to slow down and show me over and over again what she was doing. Watching her move the string over and under the needles while barely looking at them was fascinating, not unlike watching Olympic gymnasts twist three or more times in the air within seconds. It looks so easy, so effortless, in the way only hours and years of repetition can create. Back to Thursday. Nonna was ready to go out. She’d sat down for a moment on the living room sofa. She probably didn’t know that it was the last thing she’d ever do. She blacked out, and despite the fact that my cousin (who is only 19) was in the apartment with her and (bravely! incredibly!) gave her CPR until the EMT crew got there, there was no reviving her. Like everything else Nonna tackled in life, her dying was simple, quick, and no fuss. Ever practical, even in her last moments. 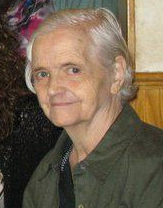 About a year or so ago, my grandmother had blacked out for a few moments from a drop in blood pressure. When talking about it to my mother afterwards, she’d told her, “Listen, when I was out I didn’t feel any pain, nothing. When I die, this is the way I want to go.” In the end, that was how she went. It was simple, but that doesn’t mean it didn’t leave those of us still living with our mouths open in shock and disbelief. Why am I talking about death and dying on a blog that’s supposed to be about living life on vacation? You might be wondering this. I wondered it myself. Unfortunately life isn’t always unicorns and rainbows. If anyone had reason to feel self-pity and shut down and stop living, it would be my grandmother. She had to grow up as a child – her father couldn’t really be a father to her or her siblings because he was an alcoholic and a gambler. Her mother, understandably, did shut down and went to live by herself in a mountain cabin. She worked from a young age, and took care of her younger siblings. She lived through WWII in a country that saw bombs dropped on them from airplanes. Later, she moved to a country where she didn’t speak the language and had to leave one of her daughters and her family in Italy. She lost her husband to cancer. She then lost her siblings. Still, she laughed and kept cooking for the family she still had and gave us presents at all the holidays and planned outings with her daughter and teased us and kissed us and fed us. Needless to say she never finds that mustard seed. If the point of this project is to live our lives now, then nothing reinforces that point more than death. We’ll all die. We’ll all lose loved ones. All the more reason not to waste time on the unimportant things. All the more reason to savor the time we do have, with the people we love. All the more reason to let go of the little annoyances and ‘stuff’ that comes up. All the more reason to stop postponing whatever it is that you want to do and go out and just do it. 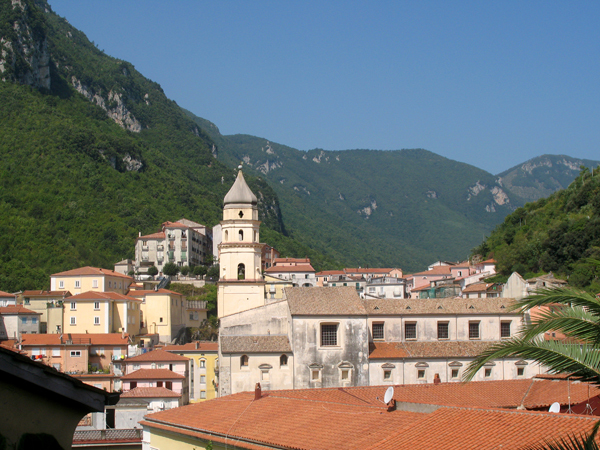 My aunt in Italy recently underwent brain surgery and said that while she was out, Nonno had come to her in a dream and taken her for a passeggiata – a typically Italian leisurely stroll – through green, green mountains filled with sunshine. She’d seen angels and beautiful plants and views along the way. My grandfather had told her she needed to get well, to save herself. I keep wondering if my grandmother saw something similar in her last few moments of life – if her husband came back to bring her with him. If so, I’d imagine that would be hard to pull away from. I hope she’s enjoying her permanent vacation in the mountains with my grandfather. Posted in thoughts and tagged death, family, life. Bookmark the permalink. Nora, your tribute to your Nonno Beatrice is absolutely beautiful. I imagine she’d be proud not only of your fantastic details in this, but of your emphasis on “living.” I’m sorry to hear about your grandmother; it’s clear that she left you with many gifts. Thanks Val. And I love that word too!